Because most of the costume contests in which we participate are outside in the rainy Pacific Northwest, I elected to create my costume out of fabric and other materials that would hold up to the weather and would allow me to use the costume over and over again. I scored on the grey and white fabric, which was on sale closeout for $3.99/yard plus an additional 20% off my total purchase price using a JoAnn Fabrics coupon (yay!). I did require nearly twelve yards of fabric between the shark costume and the vinyl for the boat. A trip to the hardware store provided me with my PVC braces to keep the tail straight and to give rigidity to my vinyl boat. I use a harness underneath the body sheet to fasten the PVC "skeleton" that consists of a shaft on each side, joined by two 45 degree PVC angles meeting in the middle to a "T" to which the tail piece is attached. The shorter lengths are glued together, but I decided to bolt the longer pieces in place so the apparatus could be dismantled for ease of storage. I splurged and spent $20 on a beard and mustache attached by spirit gum. Nobody recognized me, so I think it was worth the investment! The jacket is a new winter jacket for me for this year, so I did not figure it (or the hat) into the cost estimate as they serve a second purpose. In all, I have about $150 invested in creating this costume. It made its debut at our local Halloween Prize Ride at the Pilchuck Tree Farm in Arlington, WA. I will likely take it to some open shows and perhaps another Halloween ride next year. 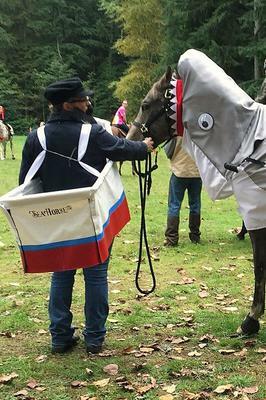 It was my horse's first experience in Halloween costume (as far as I know), but he acted like he did it daily. When I first started walking him, the tail bounced a little and he spun his head around to look at it. Once he realized there was no threat, he walked like he wore a shark tail every day. I had to walk between two trailers to get to the judging area and he spooked all four horses tied to the trailers. We had to stop and talk to the horses to calm them down before we could walk safely by! We were pretty popular outside the judging area and felt like celebrities, as passers by stopped to comment and take photos. I enjoyed having the creative outlet and seeing the costume progress from concept to reality and am tickled that it turned out exactly as I had hoped! Comments for I think I need a bigger boat! I saw this costume in person. It was a hoot! The horse was so well-mannered and quiet. Haven't Seen It Done Before! I like that this costume is unique. 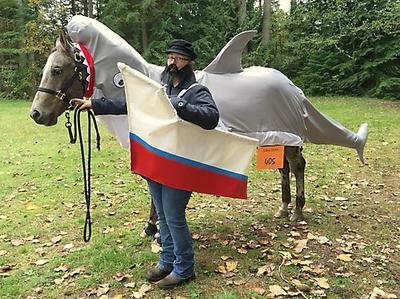 I can't say that I have ever seen a horse transformed to a shark! The nose adds extra dimension and I love the teeth! This is a great costume and description. Thanks so much for sharing it! 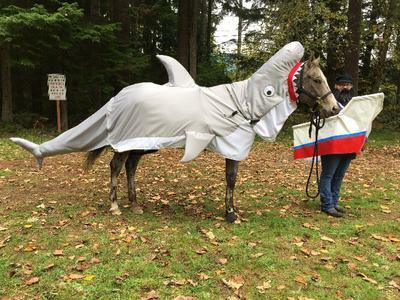 Return to Share Your Best Halloween Horse Costumes 2015.